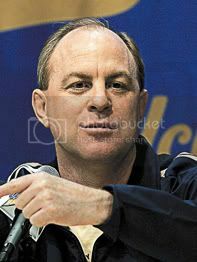 With the first regular season game approaching on Friday against Portland State, UCLA Head Coach Ben Howland is very satisfied with the team's effort but is not happy with the team's progress to this point, considering the string of injuries the team has endured recently. "We're behind due to injuries," Howland said. "We can't control it (the injuries), but the reality is I'm not happy about it." Howland wants to insert another zone offense scheme and practice a few new inbound plays. UCLA was only able to suit up 7 of their 11 scholarship players against Chico State on Monday. Michael Roll is scheduled to be out 3-5 weeks with a foot injury and Darren Collison is listed as highly doubtful for Friday's game due to a sprained knee, however Josh Shipp is expected to return to the line-up against Portland State. "Josh is still getting treatment on his thumb and is doing cardio work-outs, Howland said. "We'll have him try shooting tomorrow, but he needs to practice to get his rhythm back before Friday." With Collison out, Shipp will likely be the back-up point guard although Howland mentioned Mustafa Abdul-Hamid may also see some action on Friday. With the flurry of injuries, both reserves Chace Stanback and Nikola Dragovic saw extra action on Monday against Chico State. While Stanback had a solid line in the box score, contributing 10 points on 4 of 9 shooting and had five assists in 23 minutes, Coach Howland still sees much room for improvement. "Chace took 3 or 4 bad shots, which he's going to learn those aren't good shots for the team," Howland said. "We may get away with him taking those bad shots in exhibition games but we won't against the upcoming teams we'll be facing." "He's working hard to get better defensively," Howland said of his young freshman, "But he still has problems staying in front of the ball and at times getting beat on penetration." Dragovic, a sophomore from Serbia, got his first start as a Bruin against Chico State. He scored 7 points and made some nice post entry passes into Kevin Love for easy basket opportunities. In addition, Dragovic took advantage of his size and length to deflect a number of passes and recorded two blocks in the game. "Nikola is better than he was a year ago when he had no idea what was expected of him," Howland said. "He has some limitations athletically with his speed and quickness, but he is trying harder. As long as he is working to get better that's all you can ask."